Halibut are plentiful in the marine waters of Alaska and are a favorite catch for those who love to fish. They are the largest of the flatfishes with females weighing in at upwards of 400 lbs. Male halibut are generally smaller than female, most weighing less, under 100 lbs. An average halibut catch weighs on average 15-20 lbs. Halibut generally swim on the bottom of the seafloor and can be caught at depths between 90-900 feet. They swim sideways in the water, and both of their eyes are found on one side of their body. The best time for catching halibut is generally thought to be between May and September and they are plentiful in the waters of Ketchikan. Anglers Adventures & Outfitters offer private, guided Ketchikan fishing charters. 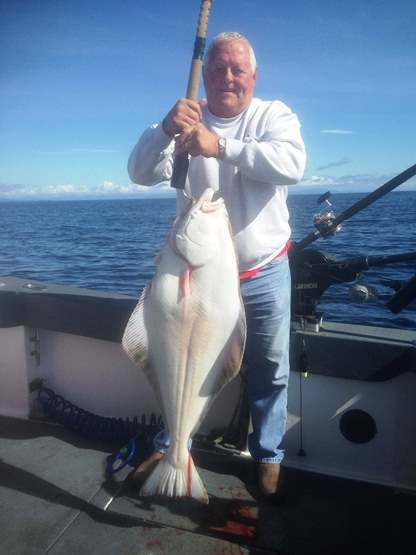 One of our most popular fishing trips are day trips for halibut. A fishing trip can be ideal for a group of friends wanting to reconnect, or family members looking to share an adventure. In addition to catching halibut, a guided fishing trip is a great way to see the breathtaking landscape of Alaska. Halibut fishing is a big business in Alaska, with over 70,000,000 pounds caught annually. Even if you are a novice and have never fished before – you can be part of this Alaska tradition. Anglers Adventures & Outfitters can provide a once in a lifetime halibut fishing experience. We can take you to locations that are off the beaten path, and where we know you and your family and friends can have a successful fishing trip. You also do not have to worry about having (or packing) the right gear. We provide this for you as well including all bait, tackle, lures, snacks and drinks. Our founder, and captain of the Sierra Dawn, Brian Ringeisen, has more than 25 years of experience navigating the waters of Ketchikan and will help ensure that your fishing trip is all you are hoping for. Book your Ketchikan Fishing Trip Now! Anglers Adventures & Outfitters offers a full dayor multi-day options for chartered halibut fishing trips. If you are vacationing in Alaska in the coming months, consider a charter fishing trip as one of your excursions. We fish out of Knudson Cove – which is close to many of the best fishing grounds but a bit removed from the busy waters of downtown Ketchikan. 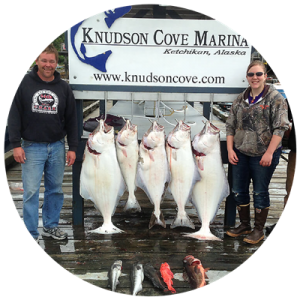 Call Brian today at (907) 254-0880 to schedule your halibut fishing trip in the Ketchikan waters.